The most frequently asked questions about our artificial rocks are about size. We get it - since these fake rocks are designed to mimic real ones, their sizes don't fit into a nice box. To give you an easier way to compare rock sizes, we put together this size reference guide, grouping rocks of similar size together. 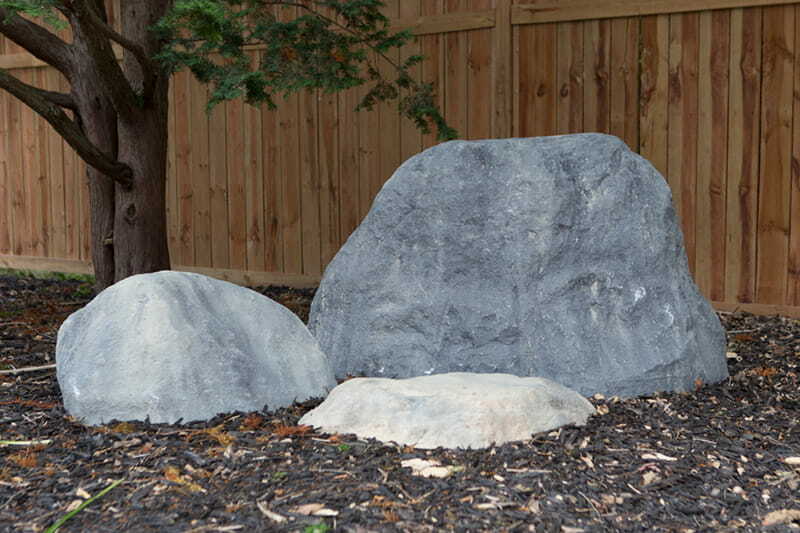 Ranging from small to jumbo, these fake rocks are handy hiding spots for outdoor fixtures such as electrical outlets, well heads, septic cleanouts and more. These artificial boulders are large enough to cover septic tank risers, irrigation equipment, telephone pedestals and more. Skimmers are low to the ground and cover a large surface area, perfect for concealing drain tiles, septic lids, manhole covers and more. These rocks are uniquely sized and don't fall neatly in the above categories. Below are different angles of each to offer you a better perspective. 31" x 23.5" x 12"
47" x 44" x 13.5"
For more information and diagrams, check out our blog post on how to choose the right size fake rock. You can also contact us by email or reach out to us on Facebook.